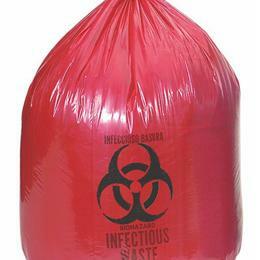 Red Liners - Biohazard: High Performance, Super Strong X-Seal Bag Is Designed Without Gussets. The X-Seal Significantly Reduces The Seal Area To Minimize Seal Failures. Bag Conforms To Container'S Shape And Distributes The Weight Of The Refuse Evenly Around The Bag. Helps Eliminate Leakage Problems. Printed In English And Spanish. Low Density 31" X 43", 2 Mil, 33 Gal.